Rabindranath Tagore’s compositions were chosen by two nations as national anthems: India’s Jana Gana Mana and Bangladesh’s Amar Shonar Bangla. The Sri Lankan national anthem was inspired by his work. Tributes and homage poured from all over the world on 157th birth anniversary of India’s iconic writer, thinker, poet and freedom fighter Rabindranath Tagore. Leaders across parties including Nobel Prize body took to Twitter to remember Tagore on his birth anniversary. Rabindranath Tagore was a Bengali polymath, who reshaped Bengali literature and music, as well as Indian art with Contextual Modernism in the late 19th and early 20th centuries. He was the first non-European to win Nobel Prize in literature for his collection of poems– Gitanjali for “profoundly sensitive, fresh and beautiful verse”. Tagore is often referred to as “the Bard of Bengal”. His compositions were chosen by two nations as national anthems: India’s Jana Gana Mana and Bangladesh’s Amar Shonar Bangla. The Sri Lankan national anthem was inspired by his work. Tagore contribution to Indian literature is considered unparalleled, however his legacy also endures in the institution he founded, Visva-Bharati University. As per Bengali calendar his birthday (Pochishe Boishakh) falls on 9 May in 2018, and most of the official functions have been planned on that day. Union Minister Ravi Shankar Prasad paid tribute to Tagore saying, “My tribute to the author of the Indian National Anthem “Jana Gana Mana” & Nobel laureate Shri #RabindranathTagore Ji on his birth anniversary”. Railway Minister Piyush Goyal remembered Tagore on his 157th birth anniversary saying “Remembering one of India’s greatest thinkers, Gurudev Rabindranath Tagore, on his birth anniversary. His contribution to Indian literature remains unparalleled”. Haryana Chief Minister Manohar Lal Khattar paid tribute to Tagore on Twitter saying, “Tributes to the legendary poet, writer, philosopher & Nobel Laureate, Shri #RabindranathTagore ji on his Jayanti. The Nation will always remember him for his inspirational work and the immortal National Anthem”. 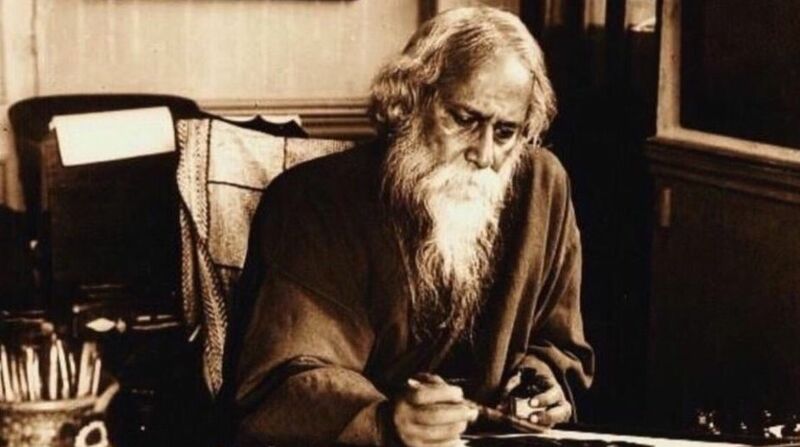 Tripura Chief Minister Biplab Deb in a tweet said , “Remembering Gurudev Rabindranath Tagore, great writer, thinker on his birth anniversary. He played key role in reshaping Indian literature”. Nobel Prize body on Monday celebrated the birth anniversary of Rabindranath Tagore. We’re celebrating the birthday of a true great: Rabindranath Tagore, who was born #OnThisDay in 1861 in Calcutta, India. On Tagore’s birth anniversary, Congress leader Jyotiraditya Scindia in a tweet said, “Everyday, I strive to live by his words – Let me not pray to be sheltered from dangers, but to be fearless in facing them”. Andhra Pradesh Chief Minister Chandrababu Naidu also paid tribute to the great poet. Remembering the great poet, Gurudev #RabindranathTagore on his 157th Birth Anniversary. His words will continue to inspire us. Congress leader Randeep Singh Surjewala took to Twitter saying, “Remembering Gurudev #RabindranathTagore on his Birth Anniversary. His immense contribution in shaping the Nation’s conscience during the National Movement and beyond shall always be cherished for generations to come”. Minister of State for External Affairs VK Singh also remembered “one of India’s greatest thinkers, Gurudev Rabindranath Tagore, on his birth anniversary. His contribution to Indian literature remains unparalleled”. Remembering one of India’s greatest thinkers, Gurudev Rabindranath Tagore, on his birth anniversary. His contribution to Indian literature remains unparalleled. Odisha Chief Minister Naveen Patnaik said “Creator of our National anthem, he will continue to inspire humanity through his illuminating body of works that convey the message of oneness, peace & tolerance”. Padma Shri awardee sand artist Sudarsan Pattnaik shared one of his sand arts on Tagore’s 157th birth anniversary. Former deputy Chief Minister of Punjab Sukhbir Singh Badal paid homage “to one of India’s greatest thinker #RabindranathTagore , the composer of National Anthem “Jana Gana Mana”; and a great poet and philosopher, on his birth anniversary. The legacy left behind by him can never be forgotten. “If no one heeds your call then march alone. If everyone keeps their mouth shut and is afraid, then with an open heart you speak your mind freely and march alone.’ This saying by Gurudev #RabindranathTagore has been a source of inspiration in my life”, said Nobel Peace Prize awardee Kailash Satyarthi on Rabindranath Tagore’s 157th birth anniversary.